It’s certainly been a challenging few months but thanks to the Tickled Trout’s amazing staff and suppliers we were never beaten by the snow. We even had local suppliers helping each other out to coordinate runs out to Barlow – we were very grateful and once again it proves how good it is to use the wonderful suppliers on our doorstep. Thankfully it’s time to look forward to a new season (good riddance to snow) and enjoy, hopefully, a bit of warmth. I couldn’t wait for the first wild garlic leaf to appear and the first asparagus to arrive and it is now in abundance! The kitchen has been working earnestly on our new Spring Menu which will be ready to go at the beginning of May. It is always a real team effort in developing a new dish. The chefs bounce ideas constantly, create elements of dishes and work out best cooking methods before working how to put it all together to present a delicious dish which is aesthetically pleasing. There is much doodling on paper! There will of course be the Tickled Trout favourites but I am so pleased with the new ‘something special’ dishes the kitchen has developed. New starters, new mains and delicious desserts have been carefully put together, tasted (by staff who suddenly seem to appear in the kitchen!) and refined. See our online menu! 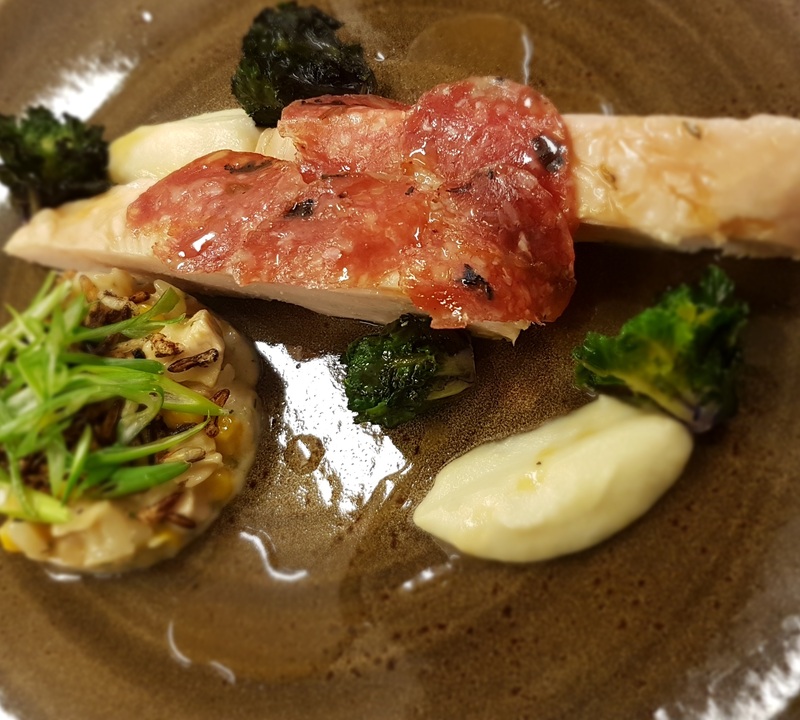 It’s hard to choose a favourite but I do enjoy the poached chicken with a smoked chicken and sweetcorn risotto, Jerusalem artichoke puree, purple sprouting broccoli and truffle salami. The desert which has created much interest is the iced Yorkshire rhubarb parfait with the rapeseed oil and poppy seed cake. So now the weather is improving it would be great to welcome you to sample our new menu. We still have some availability in our holiday cottages https://www.tickledtroutbarlow.com/our-holiday-cottages-barlow - spring is a great time to visit Barlow, the lambs in the field just up the road from us always raise a smile! So, why don’t you come along to The Tickled Trout and sample some of our seasonal specials while they last? Call to book a reservation on 0114 289 1111, or take a closer look at our web form and menus available for download – so that you can make your minds up before you visit!